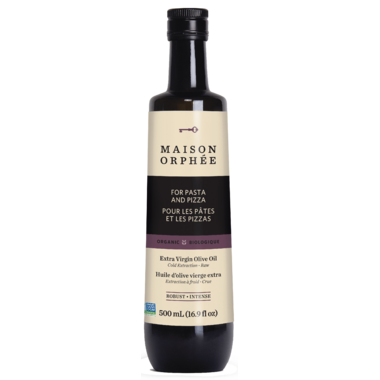 Maison Orphee Organic Extra Virgin Olive Oil is sourced from perfectly ripe olives, which imparts a peppery, slightly spicy aroma. Its robust flavour pairs perfectly with pasta, tomatoes, eggplants and grilled white fish. Brings out the best in hearty soups and grilled vegetables as well! This, like all Maison Orphee oils are fabulous. My absolute favourite is the ORGANIC EXTRA VIRGIN OLIVE OIL FRUITY ROBUST - ITALY that I haven't seen available on Well.ca yet but have ordered from Orphee's website. My only complaint about this and all the Orphee oils, and why I gave this a 4 star instead of the 5 stars the oil itself deserves, is that for some reason, Orphee does not fill the bottles. Every bottle looks half empty! Okay that's an exaggeration but seriously, the first 2.5 inches - more than the entire neck of the bottle is empty. They stop filling the bottles about a centimeter below the neck. I hate that!